The Techrules supercar has an aircraft-inspired three-seat cockpit design with the driver in the center. 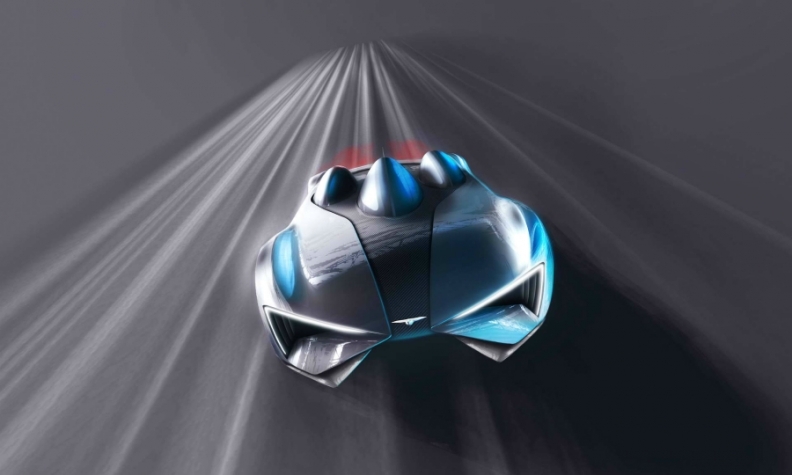 TURIN -- Chinese startup Techrules will debut a supercar at the Geneva auto show next month styled by Italian designers Giorgetto Giugiaro and his son Fabrizio. The as yet unnamed car will be the production version of the 1,030-hp GT96 concept unveiled in Geneva last year. The car will be powered by a turbine-recharging hybrid powertrain first seen in last year's concept. It uses a microturbine to generate electricity to charge a battery pack. The battery powers the motors that drive the wheels. The car could run on any type of fossil or gas fuel. The supercar's aircraft-inspired three-seat, three cockpit design, with the driver in the center as in the 1988 McLaren F1 road car, "is designed to provide occupants with exceptional visibility," Techrules said in a statement. The styling characteristics and technology seen in the supercar will be seen "across a family of models in the coming years," the company said. The supercar is the first public project for the Giugiaros' new company GFG Style, which stands for Giorgetto Fabrizio Giugiaro. In June 2015, Giorgetto, 78 and Fabrizio, 51, severed ties with Volkswagen Group after selling the remaining part of their Italdesign styling and engineering company to the group's Audi division. Giorgetto styled the Maserati Ghibli, De Tomaso Mangusta and Lotus Esprit during his long career. Fabrizio Giugiaro said that GFG is working on four to five projects a year, with a production car for a Japanese automaker already approved for production and other ongoing projects for Chinese automakers.